‘Nanda Malini and Somathilaka Jayamaha backed by the musical direction of Suresh Malliyadde and a 14 piece orchestra. 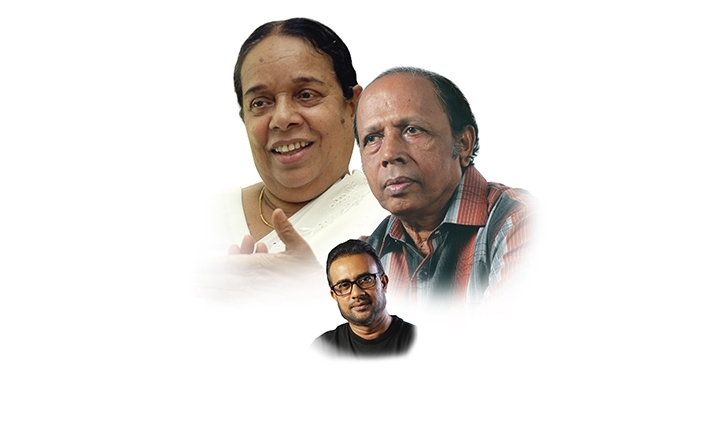 A collaboration of two of Sri Lanka’s iconic vocalists who have made their individual yet significant contributions to the history of the nations musical journey. Nanda Malini the unique voice of Sri Lanka, renowned for her music that encapsulates real life themes echoing many socio-cultural factors of life. For this reason, she has a strong reputation for creating a new perspective that redefines Sri Lankan classical music. Somathilaka Jayamaha, one of the few artists in Sri Lanka who creates lyrics, melodies and sings. His humble and reserved nature allowed him to maintain a low profile throughout his career, however with time there is no doubt Sri Lanka has come to acknowledge quality and depth in his music. Suresh Maliyadde is best of Sri Lanka’s modern day musicians; his ability to communicate well between classical music and modern instruments allows him to compose music for a great part of the industry in collaboration with singers, filmmakers and musicians alike. Join us on this rare occasion where we celebrate life in many stages, through some of Sri Lanka’s greatest classical compositions that are now well and truly a part of the small country’s history.